NADI, Fiji, April 3, 2012 (ENS) – Five people have died, thousands fled their homes, and thousands of tourists are stranded in Fiji after Tropical Cyclone Daphne blew by the South Pacific nation Monday, bringing heavy rain and strong winds. The center of the cyclone passed about 500 kilometers (300 miles) southwest of Nadi, on Fiji’s main island, Viti Levu. While “damaging gale force winds” and floods were predicted by the Fiji Meteorological Service Monday, officials today said “wind and rain have been nowhere near” the forecasts for Daphne. Still, more than 11,700 Fiji residents have been forced into evacuation centers after severe flooding drove them from their homes and damaged roads, hospitals, schools and crops. 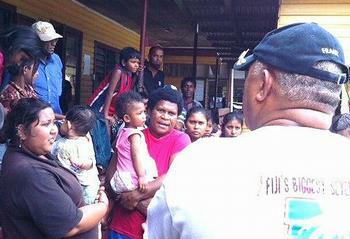 “All is lost but we are lucky to be alive,” one evacuee told the “Fiji Sun” newspaper. Many flood survivors said they could not save anything as the water rose in their homes. A 15-day state of emergency has been declared in Fiji’s west coast areas, and a flood watch is currently in place as more rains are expected to hit the country. People in vulnerable areas have been advised to evacuate, but getting the message out to remote areas which are still out of electricity is difficult. Visitors beseiged the airport after authorities lifted a flight embargo on Monday, but they have been unable to get out. Some slept last night on cardboard laid on the airport floor as accomodations around Nadi are fully booked. An empty Air New Zealand B747 was turned back Sunday when strong winds and heavy rains forced the pilot to abandon landing at Nadi International Airport. Air New Zealand has no scheduled flights to Fiji today. Fiji’s national airline, Air Pacific, said it will resume normal operations “soon,” once all flood-affected staff are able to return to work. All inbound flights are flying in empty at the request of the government until further notice. In Nadi, police officers are blocking access to the town’s main street, where the smell of decaying food and sewage is choking as all sewage systems in Nadi’s Western District are flooded out. All schools in that district remain closed until further notice. The president of the Fiji Law Society told Radio New Zealand Tuesday that parts of Nadi look like a war zone and the government lacks the funds and resources to deal with the situation. 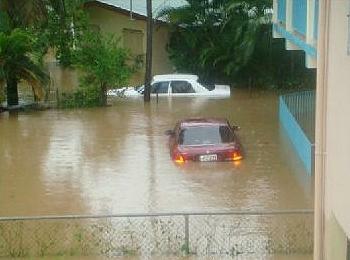 Nadi resident Dorsami Naidu says every shop and home has been damaged and has no power or water. He is urging the government to make water available and supply boats to rescue stranded people. Fiji Prime Minister Frank Bainimarama, who visited several evacuation centers Monday, said that all evacuation centers where infants and children are sheltered will be provided with water purifiers at the expense of the Prime Minister’s Office. “This is to ensure that all babies and children have access to clean drinking water. At all times there needs to be water and food for people in evacuation centers,” Bainimarama said. But health authorities in the Western Division fear that overcrowding and unsanitary practices could lead to an outbreak of communicable diseases in the evacuation center. Addressing heads of government departments at an emergency operations center briefing in Lautoka Monday, Divisional Health Inspector Dip Chand said medical teams are working with district officers to inspect and assess the situation. “We are seriously concerned about the state of evacuation centers. We have to put in place strategies that will prevent outbreaks and contain diseases if they do exist at these centers. We have to ensure that we do not reach the crisis level,” said Chand. The Fiji Electricity Authority said today it will ration power in the Central Division after a transmission tower fell and disrupted supply. Australian Foreign Affairs Minister Bob Carr has announced A$1 million worth of emergency aid for the worst-affected areas in the Western and Central Divisions. Senator Carr said Australia would also provide immediate financial assistance to the Fiji Red Cross and UNICEF to assess the damage and replenish essential water and sanitation supplies, medicine, clothing and shelter. These organisations have now started to deliver these goods to communities that can be reached. This support follows Australian assistance for a helicopter used on Monday and Tuesday by Australia-based international aid agency Act for Peace to conduct aerial surveys of flooded areas to assess damage and the needs of affected communities. New Zealand Prime Minister John Key said his government would send aid if Fiji’s government requests it. “These types of events are likely to continue to occur,” said Angelika Planitz, sub-regional coordinator for the Pacific for the UN International Strategy for Disaster Reduction, UNISDR. A recent publication produced by UNISDR and the UN Development Programme warned that in western Fiji, high-intensity floods will become more frequent. 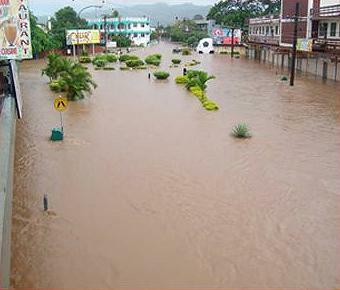 In the Nadi area, for example, these type of floods used to occur every 190 years, but by 2100 it is projected that they will occur every 25 years.